The Omaha FXFL franchise is the first one to be named, and league founder Brian Woods certainly chose a unique moniker for the team. Woods says the extinct animal accurately depicts the type of team Omahans want. Big, strong, unstoppable. I get that. I like that. The color scheme ties in to Nebraska’s rich college football tradition, both with UNL and the now-defunct program at Nebraska-Omaha. The helmet, pictured above, and the logo below are sharp. Annnnnd here’s where Woods runs into trouble. The animal was extinct. As of 10,000 years ago. The mammoth is the Nebraska state fossil, according to the Omaha World-Herald. At least more mammoths were unearthed here than in any other state. Mammoth football. Join the herd. The mascot? Tusker, of course — so you can have “lil Tuskers” and big Huskers. Definitely a marketing ploy in there somewhere. The fossil zone for, well, scratch that. And, obviously, mammoth-sized concessions. Burgers? Fries? Beer? You name it. 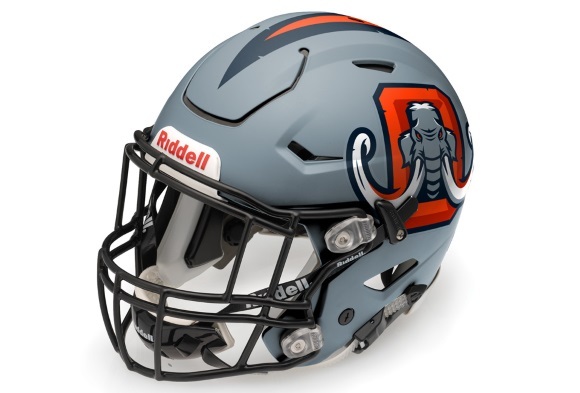 I like the Omaha Mammoths already, and merchandise doesn’t go on sale for another three weeks. I just hope the team doesn’t go the way of the animal.